The NBA has become so popular that interest remains high in free agency and postseason movement, arguably more so than in the recently concluded lopsided Finals that Golden State swept from Cleveland. Anyone old enough to remember the way the NBA was in the ‘60s and ‘70s, or even the early 80s, would have to marvel at the transformation it’s made from niche sport to mainstream entertainment. During the ‘60s especially, but also during the ‘70s and parts of the ‘80s it wasn’t uncommon to see lots of empty seats at NBA regular season games. For many years ABC, then the league’s principal (and only) TV partner, wouldn’t even start broadcasting games until there was about a month left in the season. Then there was only one game on Sunday afternoons. ABC once even began a broadcast of a Finals game in progress because they didn’t want to cut away from an auto racing event. Occasionally they would air some of the Finals during the week, but they would essentially ignore the preliminary playoff rounds, and treat 3/4 of the regular season as something that didn’t matter. There was no ESPN, no NBA TV, and no coverage of the draft. International players weren’t even a consideration. Fast forward to the present and the NBA has become a year-round league, with a host of reporters, websites, broadcasters and correspondents covering it fulltime. Despite the NBA Finals being about as exciting as watching paint dry other than Game 1, ratings for the first three games were nearly as high as last year’s record. They plummeted as expected for Game 4, since pretty much everyone knew things were over at that point. Still, the overall playoff ratings for the entire postseason came very close to equaling the record highs of last year, and the Eastern and Western Conference Finals did huge business for ESPN and TNT. Even ABC still got some of the Finals broadcasts into the Top 10. No one would even dream today of doing what the league used to do when Bird and Magic Johnson were rookies, which is to air the NBA Finals on tape delay. The famous Magic Johnson Game 6 where he played five positions and dominated the floor was shown on tape delay. Now it is possible for anyone who wants to do it to see pretty much every single NBA game. There are constant highlights all over the place. Free agency doesn’t even begin until July 1, but newspapers and websites are buzzing constantly with stories about where Lebron James, Paul George and Chris Paul may sign. 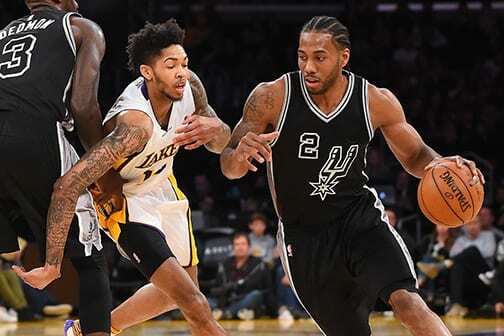 There’s constant speculation about who may or may not trade for Kawhi Leonard, whose frustration in San Antonio has prompted a trade demand. With the draft approaching, there are also several stories about which team may or may not make a trade to move up or down. The Grizzlies are definitely rumored to be considering doing some sort of deal with the number four pick, while also trying to rid themselves of Chandler Parsons, though it is highly doubtful any team will take him in a trade unless the Grizzlies are willing to pay all or most of his outlandish salary as well as possibly throw in either a player or that draft pick. With new owner Michael Pera claiming he doesn’t see why the Grizzlies can’t return to being a 50-win team next year, that adds more edge to the possible draft machinations. Though a lot of the NBA hot stove league talk can get rather tiring quickly, especially the constant comparisons between James and Michael Jordan, it’s amazing to see how much interest the league has even when they aren’t playing games. The MLB Commissioner last week announced that he’s close to getting the DH in the National League and also wants to implement some sort of rule against exaggerated defensive shifts. That couldn’t even get on the front page of a lot of sports sections due to the numerous speculative NBA stories. As an ardent baseball and basketball fan, it’s a huge turnaround to see how much popularity the NBA has gained in the past couple of decades. It’s just a shame it had to come at the expense of baseball, but that’s the way things break. Previous articleLocal Couple Wins BIG on The Price is Right!